Explore hidden gems such as Glenelg Pier and The Rundle Mall Pigs. Dedicate the 2nd (Sun) to wine at some of the top wineries in the area. There's still lots to do: admire the natural beauty at Adelaide Botanic Garden, take a tour by water with Boat Tours & Water Sports, learn more about the world around you at South Australian Museum, and contemplate the long history of Adelaide Oval. To see where to stay, more things to do, photos, and more tourist information, use the Adelaide driving holiday planning app . Auckland, New Zealand to Adelaide is an approximately 8-hour flight. You'll gain 2 hours traveling from Auckland to Adelaide due to the time zone difference. Plan for little chillier nights when traveling from Auckland in June since evenings lows in Adelaide dip to 8°C. Finish up your sightseeing early on the 4th (Tue) so you can travel to Bathurst. Bathurst is a regional city in the Central Tablelands of New South Wales, Australia. Eschew the tourist crowds and head to Wine Tours & Tastings and Australian Fossil and Mineral Museum. Get out of town with these interesting Bathurst side-trips: Gordon Falls Lookout (in Leura), Blackheath (Govetts Leap & Gallery Blackheath) and Katoomba (The Three Sisters, Blue Mountains, & more). It doesn't end there: browse for treasures at The Beekeeper's Inn and pause for some serene contemplation at Cathedral Parish of St Michael & St John. For more things to do, traveler tips, where to stay, and more tourist information, you can read our Bathurst road trip planning app . You can fly from Adelaide to Bathurst in 7 hours. Other options are to do a combination of flight and bus; or drive. Traveling from Adelaide in June, expect little chillier with lows of 3°C in Bathurst. Cap off your sightseeing on the 7th (Fri) early enough to travel to Brisbane. Explore hidden gems such as Room Escape Games and Old St Stephen's Catholic Church (Pugin Chapel). And it doesn't end there: let the kids burn off some steam at South Bank Parklands, take in nature's colorful creations at Brisbane Botanic Gardens Mt. Coot-tha, get great views at Mount Coot-tha Lookout, and walk around Roma Street Parkland. 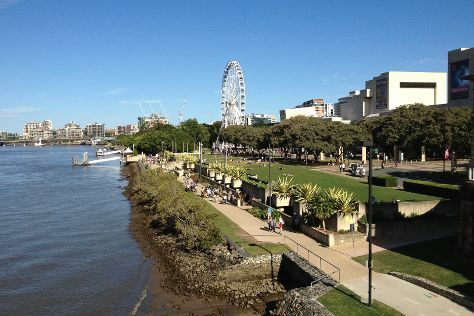 To find photos, more things to do, and more tourist information, read Brisbane trip itinerary builder site . Traveling by combination of bus and flight from Bathurst to Brisbane takes 5.5 hours. Alternatively, you can do a combination of train and flight; or drive. Prepare for a bit warmer weather when traveling from Bathurst in June: high temperatures in Brisbane hover around 24°C and lows are around 13°C. Wrap up your sightseeing on the 10th (Mon) early enough to drive to Gold Coast. On the 11th (Tue), observe the fascinating underwater world at Sea World Theme Park. Get ready for a full day of sightseeing on the next day: get in on the family fun at Warner Bros. Movie World, enjoy the sand and surf at Surfers Paradise Beach, and then get in on the family fun at Sling Shot & Vomatron Amusement Rides Gold Coast. To find ratings, more things to do, and tourist information, read our Gold Coast sightseeing planning tool . Traveling by car from Brisbane to Gold Coast takes an hour. Alternatively, you can take a bus; or take a train. 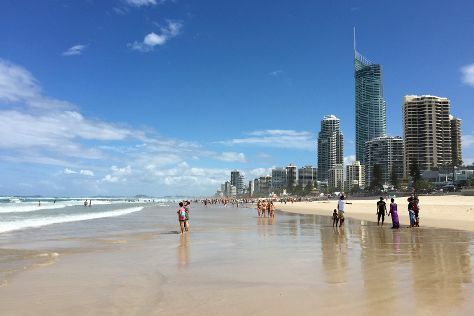 In June in Gold Coast, expect temperatures between 24°C during the day and 13°C at night. Wrap up your sightseeing on the 12th (Wed) to allow time to take a bus to Byron Bay. Start off your visit on the 13th (Thu): add some adventure to your tour with a kayaking and canoeing tour, then glide peacefully along the water with some of the best stand-up paddleboarding in the area, and then indulge your thirst for a good beer at Stone and Wood Brewery. Get ready for a full day of sightseeing on the 14th (Fri): tour the pleasant surroundings at Belongil Beach and then indulge in some personalized pampering at some of the best spas. To see more things to do, other places to visit, maps, and more tourist information, you can read our Byron Bay trip itinerary planner . Getting from Gold Coast to Byron Bay by bus takes about an hour. Other options: drive. Traveling from Gold Coast in June, expect a bit cooler with lows of 10°C in Byron Bay. On the 14th (Fri), wrap the sightseeing up by early afternoon so you can travel back home.